Consulting services provided by PrePress Express. We have been developing custom Filemaker systems for over 10 years. Henry Roth Design, Sun Studios, Moschini Productions....and our own order management system. We have also developed our own in house order tracking, estimating, metrics tracker and workflow system. The database has been integral to our fast paced workflow. 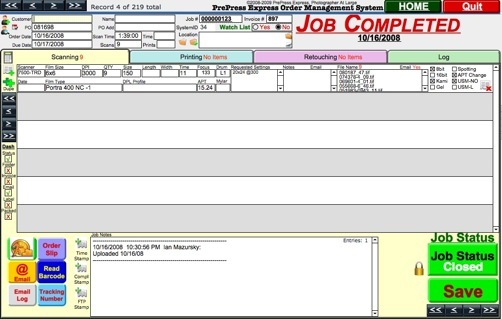 Features include, barcode support, order slips, historical reporting and metrics and email creation and tracking. In the next few months, we will start to open the system up to beta testers for a commercial product. We have also developed a Mac only filemaker printer switcher that does not require any plugins!